What other company laser etches their riders names into the bits? Honestly, I was just riding along and this happened. What do you mean it's not covered by warranty? Mikey made a bet with Jill that if he made the podium he'd shave his head and donate his hair for charity. 3rd place in GS! Gee Atherton was looking really fast all week. He placed 4th in the final. Kelly McGarry, this guy has great style, qualified in jeans and a t-shirt then opted for full race kit for finals. Neko Mulally flatted in quali's and didn't get to race. He and Richie Rude are both in high school and both killing it at pro level. Richie Rude, 16 years old, 8th place pro men. Lars over the step up on the GS course. Jill Kintner wins the US Open "4 Bryn"
Aaron Gwin for the win at the US Open! 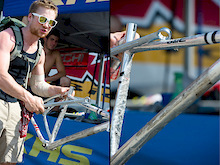 Jill Kintner considered not racing after an emotional week with Bryn crashing and breaking his leg last weekend. She pulled it together on qualifying day and placed first in the final.